The Samsung Galaxy S6. The phone marketed with the slogan “Six Appeal.” Built with a glass front and back design, the new Samsung flagship device sports the long awaited premium build quality demanded for by fans. But with this premium build comes higher risk of damaging not only the front of the S6, but the back as well, doubling the chance of damage. Based off of that, you’ll probably be looking for a case to protect your brand new Galaxy S6 in, and only want to spend a fraction of the price of your new phone on a case that will protect. Well look no further, because we here at GadgetGuruHD have compiled the top 5 Samsung Galaxy S6 cases you can buy for under $20. Built with a TPU edging on a clear plastic frame, the Poetic Affinity Series Protective Case is one of the best, and cheapest S6 cases your money can buy today. The TPU wrapping protects the S6 from drops, lowering impact due to it’s absorbent nature, and its clear back doesn’t hide any of your S6’s “six appeal.” Coming with 3 professional colors that blend well with any color the S6 is offered in, this phone case should be on everyone’s list of potential cases. Without looking too flashy, but adding a bit of bulk, this phone case is sophisticated and protective, and for $12.95, you can’t go wrong. Buy your Poetic Affinity Series Protective Case for $12.95 on Amazon today. My personal favorite of all S6 cases, the Obliq Slim Metal Case sports a polycarbonate frame with an additional metal back, giving the case an ultra premium feel, and adding additional aesthetic tweaks to your S6 without sacrificing it’s original beauty. The Ultra Slim design of the case also doesn’t add too much bulk to the phone, maximizing comfort and mobility. Offered in 6 different colors, this phone case is definitely worth looking into if you are in the market for S6 cases. Coming in at $14.99, the ultra premium build quality is definitely worth the money. Buy yours on Amazon today. Built with a TPU frame wrapped in Polycarbonate, the Flexion Everything Resistant Case is slim, professional, and protects. Using Felxion’s FlexTech™ technology, this phone case is as slim as it can be without sacrificing the maximum protection it has to offer. Sadly, the case comes in only one color, but being neutral, the lack of choices isn’t worth complaining about due to the levels of protection this case has to offer. 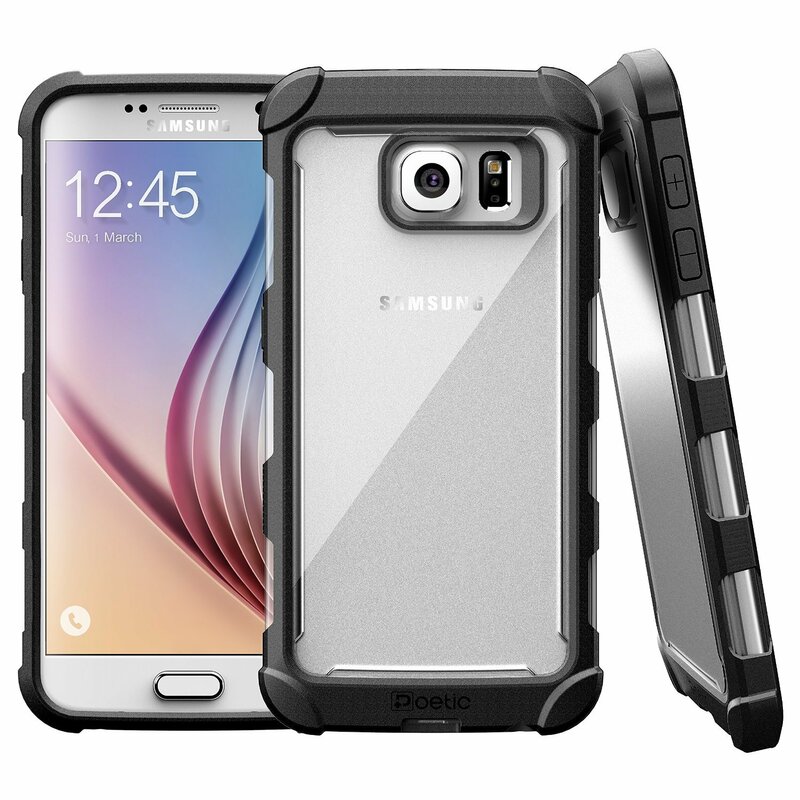 Being one of the safest S6 cases in the market today, there is no risk factor when purchasing this case. Buy yours today on Amazon for $15.99. If you’re considering buying S6 cases, and the Spigen Slim Armor Case isn’t on your list of options, I do not know where you went wrong. Sporting that TPU and Polycarbonate design, the Spigen Slim Armor Case is the best of both worlds, protection and looks. This case offers complete protection from any potential damage due to it’s air cushion technology. 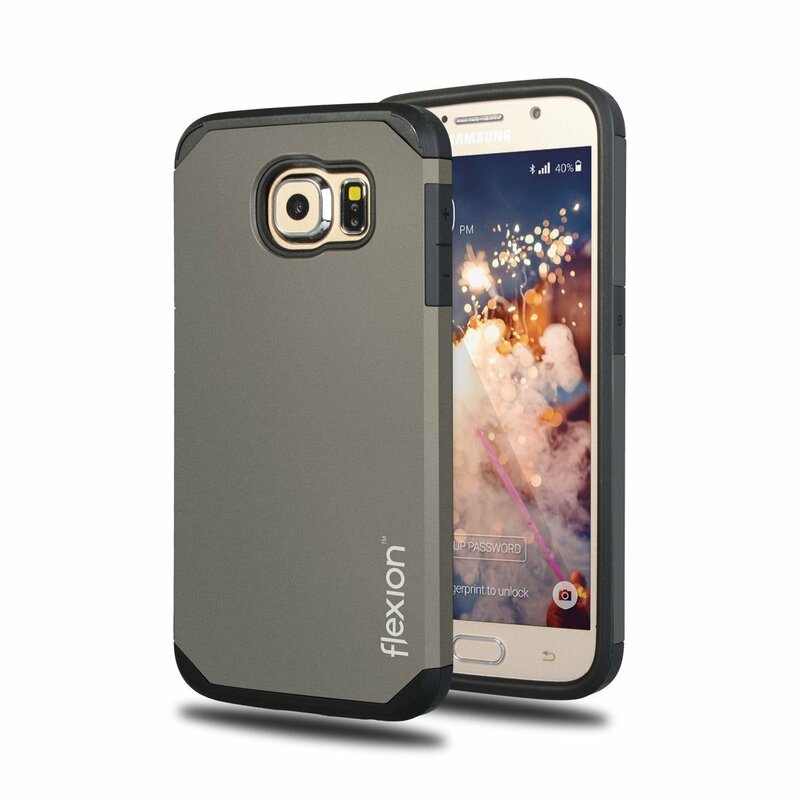 This is also one of the few S6 cases with a flip stand built into the case, making watching movies on your S6 easier. 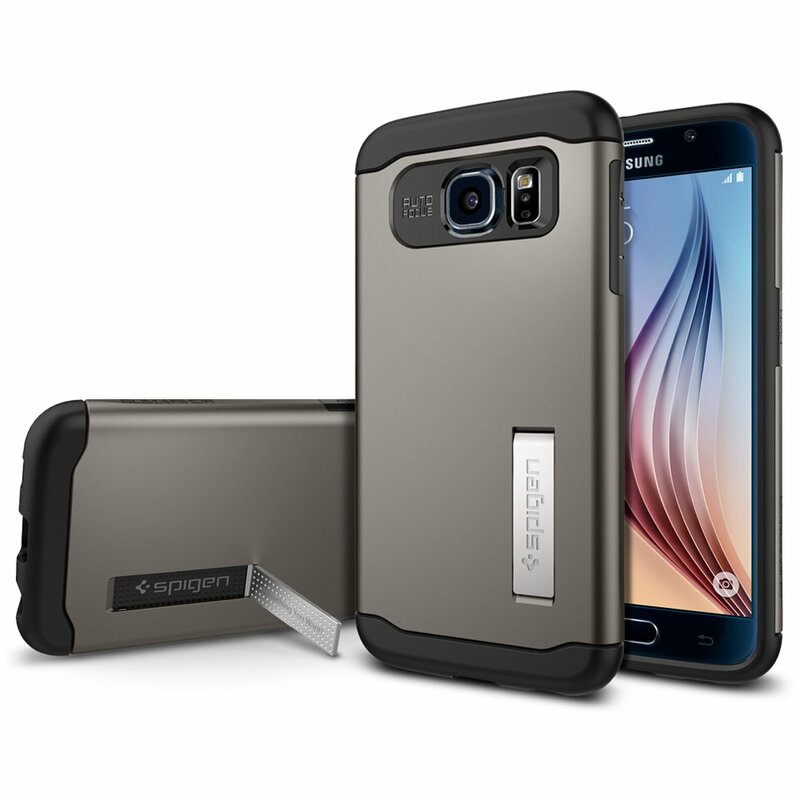 Spigen is well known as a quality phone case brand, and they’ve done it again with their S6 case. And for under $20, there are no downsides. Buy yours on Amazon today for $16.77. Being an active person, the Unicorn Beetle line of Supcase is always at the top of my list. Offering maximum protection while not being as bulky as other brands, the Supcase Unicorn Beetle Pro Case protects phones through anything you throw at it (or anything you throw it against). 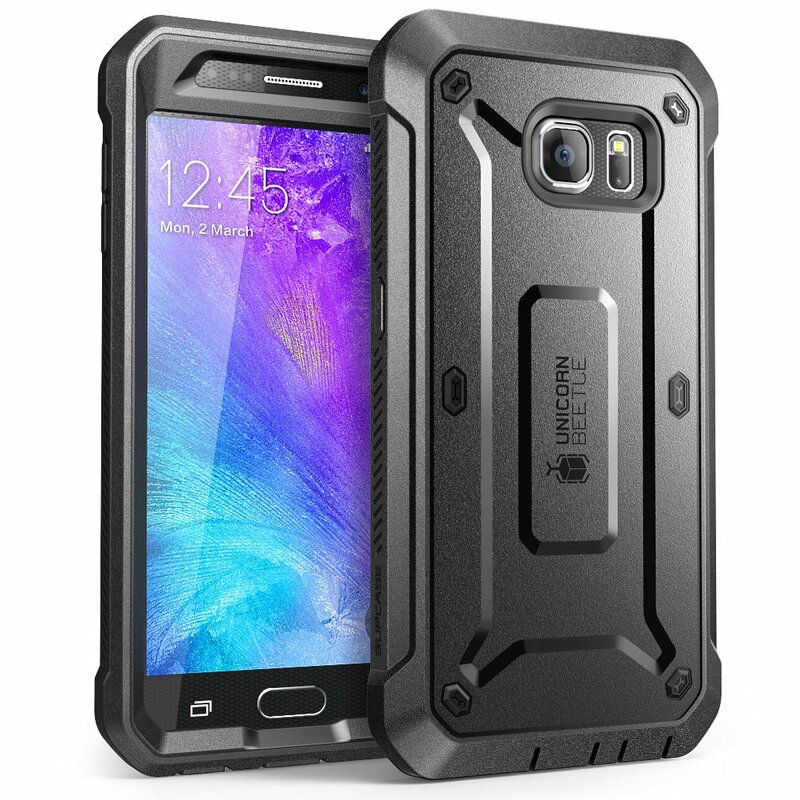 Made of TPU and Polycarbonate, with an additional built in screen-protector, the Unicorn Beetle Case Pro for the Galaxy S6 will be the go-to case for those of you who run around in life and want to keep their phone in pristine condition. It is also available in 5 unique colors, offering variety to the consumer. And even with this level of protection, it is still offered humbly for under $20. Buy yours today for $18.99 on Amazon today, you won’t regret it. 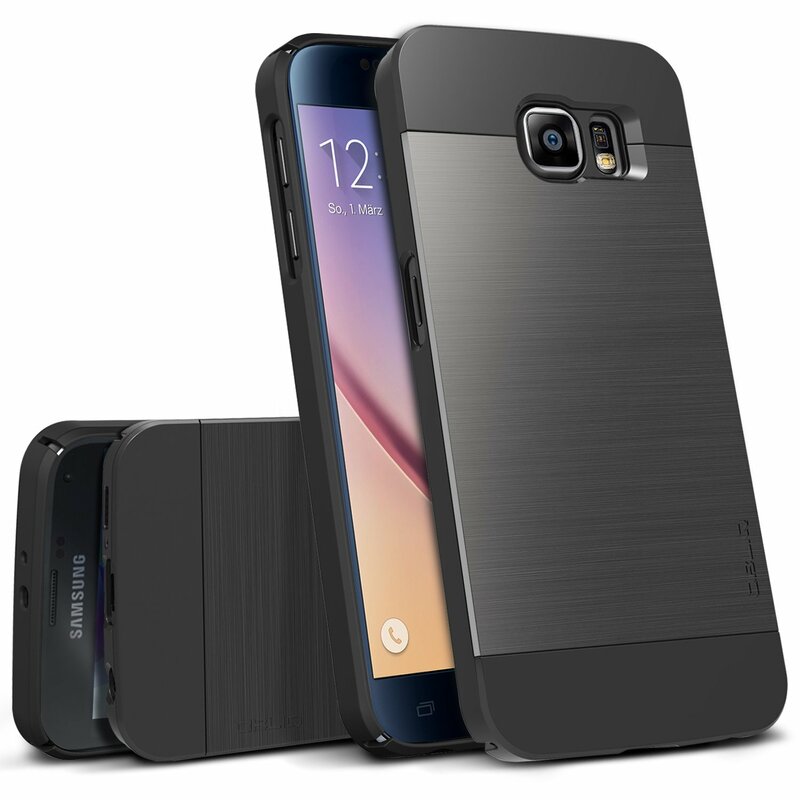 And there we have it, the top 5 cases you can buy for your Samsung Galaxy S6 without having to spend too much of your hard earned money. From the thousands of S6 cases, these are the Top 5 that are worth every cent. The best thing is, there is no pressure in choosing wisely, because there is no room for error with this list of cases.